Qatar decided to buy $500 million of Lebanese government bonds to stabilize an important Middle East country and secure a good investment, according to the country’s foreign minister. The minister, one of two Qatari royals in their 30s also entrusted last year to run the Qatar Investment Authority, the country’s $320 billion sovereign wealth fund, said Lebanon’s president had outlined his country’s situation to the Qatari emir at an Arab economic summit in Beirut. Qatar announced its decision on Monday. Energy-rich Qatar has faced a boycott since June 2017 by its larger neighbors Saudi Arabia and the United Arab Emirates, who accuse it of interfering in their internal affairs and getting too close to Iran. Qatar denies those allegations but its decision to buy Lebanese bonds will be watched closely by its rivals. Lebanon’s public debt, estimated at over 160 percent of gross domestic product this year, is projected to rise to near 180 percent by 2023, second only to Japan’s, the International Monetary Fund says. Its “debt affordability” is the weakest of all the sovereigns rated by Moody’s Investors Service. Lebanon’s struggling economy was in need of a cash infusion to reassure bond holders reeling from mixed remarks by officials about the possibility of debt restructuring this month. Finance Minister Ali Hasan Khalil roiled bond markets when he told a newspaper the country may restructure its debt as part of a plan to repair public finances battered by sluggish economic growth, a political impasse that has left it without a functioning government for months and the war in neighboring Syria. He later denied the plans, and officials got together to reassure investors the country would honor its obligations on time. Lebanon has agreed to reduce its deficit by a percentage point annually for five years as one of the main conditions to unlock $11 billion in loans and grants offered at a 2018 donor conference. 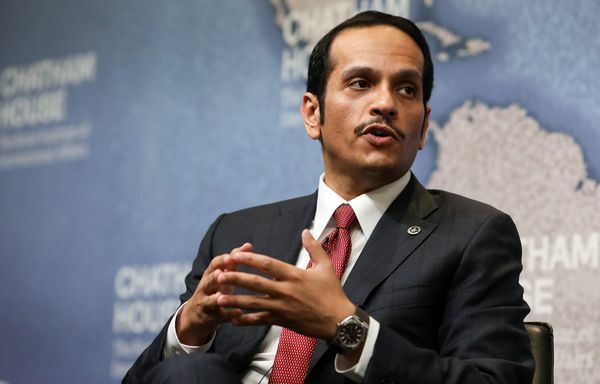 On Tuesday, Al Thani said Qatar and Iran had to work together as they were neighbors and shared an important oil field. He said he hoped that other GCC nations would start engaging with Tehran to resolve outstanding issues in the region.